The Black and White Minstrel Show was a British light entertainment show that ran on BBC television from 1958 to 1978 and was a popular stage show. It was a weekly light entertainment and variety show presenting traditional American minstrel and country songs, as well as show and music hall numbers, usually performed in blackface, and with lavish costumes. The show was created by BBC producer George Inns working with George Mitchell. The show was first broadcast on the BBC on 14 June 1958. It began as a one-off special in 1957 called The 1957 Television Minstrels featuring the male Mitchell Minstrels (after George Mitchell, the musical director) and the female Television Toppers dancers. It was popular and soon developed into a regular 45-minute show on Saturday evening prime time television, featuring a sing-along format with both solo and minstrel pieces (often with extended segueing), some country and western and music derived from other foreign folk cultures. The male Minstrels performed in blackface; the female dancers and other accompanying artists did not. The show included "comedy interludes" performed by Leslie Crowther, George Chisholm and Stan Stennett. It was initially produced by George Inns with George Mitchell. The Minstrels' main soloists were baritone Dai Francis, tenor John Boulter, and bass Tony Mercer. During the nine years that the show was broadcast in black and white, the blackface makeup was actually red as black did not film very well. By 1964, the show was achieving viewing figures of 21 million. The Minstrels also had a theatrical show produced by Robert Luff which ran for 6,477 performances from 1962 to 1972 and established itself in The Guinness Book of Records as the stage show seen by the largest number of people. At this time, the creation gained considerable international regard; in 1961 the show won a Golden Rose at Montreux for best light entertainment programme and the first three albums of songs (1960–1962) all did extremely well, the first two being long-running #1 albums in the UK Albums Chart. The first of these became the first album in UK album sales history to pass 100,000 sales. While it started off being broadcast in black and white, the show was one of the very first to be shown in colour on BBC2 in 1967. Several famous personalities guested on the show, while others started their careers there. Comedian Lenny Henry was one such star, being the first black comedian to appear, in 1975. In July 2009, Lenny Henry explained that he was contractually obliged to perform and regretted his part in the show. The show's premise began to be seen as offensive on account of its portrayal of blacked-up characters behaving in a stereotypical manner and a petition against it was received by the BBC in 1967. 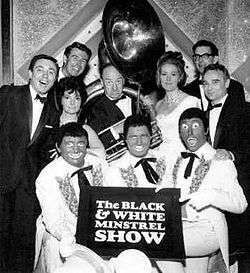 In 1969, due to continuing accusations of racism, Music Music Music, a spin-off series in which the minstrels appeared without their blackface make-up, replaced The Black and White Minstrel Show. It failed badly, was cancelled after 10 episodes and The Black and White Minstrel Show returned to win back viewers. The BBC1 TV show was cancelled in 1978 as part of a reduction in variety programming (by this point the blackface element had been reduced), while the stage show continued. Having left the Victoria Palace Theatre, where the stage show played from 1962 to 1972, the show toured almost every year to various big city and seaside resort theatres around the UK, including The Futurist in Scarborough, The Winter Gardens in Morecambe, The Festival Theatre in Paignton, The Congress Theatre in Eastbourne and The Pavilion Theatre in Bournemouth. This continued every year until 1992, when a final tour of three Butlins resorts (Minehead, Bognor Regis, and Barry Island) saw the last official Black and White Minstrel Show on stage. ↑ "Robert Luff – Telegraph". The Daily Telegraph. London. 23 February 2009. Retrieved 2009-03-01. ↑ Roberts, David (2006). British Hit Singles & Albums (19th ed.). London: Guinness World Records Limited. p. 170. ISBN 1-904994-10-5. ↑ "Minstrels founder Mitchell dies". BBC. 29 August 2002. Retrieved 2 February 2008. ↑ "Minstrels founder Mitchell dies". BBC News. 29 August 2002. Retrieved 2010-05-25. ↑ Mawer, Sharon (2007). "1961". Album Chart History. The Official UK Charts Company. Archived from the original on 2008-06-19. Retrieved 2008-10-05. ↑ TV.com (22 May 1971). "The Two Ronnies – Season 1, Episode 7: Series 1, Episode 7". TV.com. Retrieved 2012-04-08. ↑ "Alternative Roots". The Goodies. Series 7. Episode 1. 2008-11-01. ↑ "Chart Stats – George Mitchell Minstrels – The Black and White Minstrel Show". chartstats.com. Archived from the original on 19 January 2013. Retrieved 2 June 2011. ↑ "Chart Stats – George Mitchell Minstrels – Another Black and White Minstrel Show". chartstats.com. Archived from the original on 24 July 2012. Retrieved 2 June 2011. ↑ "Chart Stats – George Mitchell Minstrels – On Stage with the George Mitchell Minstrels". chartstats.com. Archived from the original on 31 July 2012. Retrieved 2 June 2011. ↑ "The Official Charts Company – The Black and White Minstrel Show". The Official Charts Company. 5 May 2013.